The Universe is impossibly vast. But you could broadcast a signal out across forever. One day he was ripped out of his life, away from the woman he loved, and woke up in the far future, the captain of a spaceship/moon on the other side of the cosmos. His crew is made up of twelve of the greatest artists, scientists, and leaders of the next eight hundred years: Including the doctor who invented the Martian race, the Queen of the British Corporation, a Chinese cyborg-warlord, an eight foot tall Australian Aborigine, a post-human physicist covered in white fur. 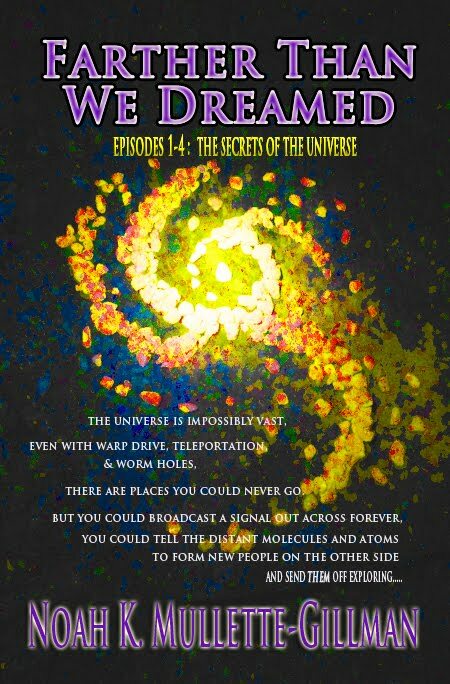 Episodes 1-4 are available together in the single volume "The Secrets of the Universe" in paperback and ebook on Amazon. This is the best way to begin reading the series. As this collected edition is an Amazon exclusive, it is available for "free" KU borrowing, or to purchase at a discount when compared to buying the episodes one at a time. Episode 2 Waves, Episode 3 Crystal, and Episode 4 Cosmic Shag are all now available a la carte on Smashwords, Amazon, Barnes and Noble , and everywhere you buy ebooks. Episode six "Shamballa" is now available in paperback and ebook on Amazon and ebook on Smashwords. Coming soon everywhere else. AND NOW, YOU CAN WATCH ME READ CHAPTER ONE TO YOU! Charlie woke up again. He lay in a flat bed without blankets or pillows. The fabric was soft and gentle like silk, or leaves, or flower petals. As he opened his eyes, great clouds of transparent purples, blues, and darker shades burned his vision, after-images of some dream. He thought about old-fashioned televisions which didn’t turn off all at once, but glowed a little less and a little less over time. He was in a large and round room with a domed ceiling. It was clean and white, like no room he had ever seen. There were statues in a circle around the ceiling. The ceiling, the walls, and the statues all appeared to be made of alabaster marble which shone with an interior light. A man sat on a small chair next to where Charlie was lying. He was drinking from a glass of water when Charlie saw him. The man looked surprised to see Charlie awake. He smiled awkwardly, placed the glass down noisily on the floor, and picked up a pad of paper. There were a lot of sloppy notes throughout the pages already. “Do you remember your name?” the man asked. “Is this reality?” the man asked. “He said I was going to be on a ship. Is this the ship? Did they teleport me here?” Charlie sat up. His forehead was aching dimly. He ran his hand over his face. He’d been shaved in his sleep. His nose had been straightened. It felt like someone else’s face. “As far as I know, I’ve never met you before,” Charlie said finally. “What do you remember from before you woke up?” The man didn’t close his mouth after asking the fifth question. He seemed strangely eager – hungry – for the answer. The man was writing feverishly on his pad. He never once looked down to see the marks he was making. Instead he stared at Charlie. He listened. Charlie had hardly said anything, how could the man find so many words to use describing it? “Assume I don’t know. Tell me what he told you.” The man picked up the glass and took another drink. “He wasn’t a man though. He was like a wild animal. He came at me out of the woods. I thought he was going to eat me. Then he started talking and said the world was an illusion. I was tired, ready to collapse. I was wondering if the talking animal was a hallucination. “He said the universe was too big for warp drive, or hyper-drive, worm holes, bending, twisting, or teleporting. There are some distances you could never cross, not with a million years to do it. But they could send something like a radio signal out past the forever, and that radio signal would find rocks and little things. It would tell the molecules where to go and how to combine with each other until they made a spaceship and they made people out on the other side. “You’re sure?” The man glanced down at his notes and made a check mark next to a word Charlie couldn’t make out upside down. The funny man was writing in cursive. The man nodded. With his left hand he grabbed Charlie by his arm, as if he was about to help him out of bed. There was a pinching sensation in Charlie’s side. He looked down to see that the man had just injected him with a hypodermic needle. Charlie pushed himself forward and reached his feet down onto the ground. He was going to grab the man. But Charlie’s legs were new and he wasn’t used to them yet. He slipped on the bloody floor and fell down. He felt the smack of his shoulder against the hard stone and he bit his tongue. He reached his hands out and felt a person there. There was a dead man on the floor right next to where he had landed. Charlie glanced up at his killer. The man was scribbling wildly in his notebook while staring back clinically at Charlie. The captain felt his face stiffening. His muscles were getting weak. He pulled at the body and turned it over so he could see the dead man’s face. The dead man looked just like Charlie remembered himself, except he had been shaven, his nose was fixed, and he had a small scar across his forehead. Charlie woke up again. He lay on his back. The first thing that he noticed was that his beard was gone. He reached up and ran his fingers over his jaw and cheeks. It had been years since he’d been clean-shaven. His hand happened to move over his nose, and Charlie was surprised to see that his nose had been straightened as well. That seemed a vain waste to him. Who cared if he had a proper nose or not? Besides, he’d earned his scars. He opened his eyes. At first everything was purple and blue. It took a while for his eyes to adjust and work properly again. The room was white. It was shaped like a dome and filled with classical statues. And there was a man sitting in a chair next to where Charlie was lying. His hair was red, but filthy and shoved roughly away from his face. He wore antique glasses and a tweed jacket. He looked to Charlie like an academic. Maybe a Scandinavian? The stranger was reading through a hand-written notebook. “Do you know where we are?” the man asked. “I just asked you.” Charlie was losing his patience. Charlie hadn’t moved, but the man held out a hand, as if to tell him not to get up. The stranger looked tired. Charlie wondered why he was being asked these questions. Were they making sure that he had arrived on the ship without losing his mind? How dangerous was being sent on a radio signal across the cosmos? Or had he been hurt and they needed to test him? Then again, maybe he was still back on Earth. Was this man his psychiatrist? That might make more sense than anything else. The stranger didn’t immediately answer. “Alright.” Charlie made himself comfortable and did his best to appear docile. “You don’t remember anything.” It wasn’t a question. The man was clearly frustrated. The man nodded. Before Charlie realized what was going on, he had been injected in the shoulder with a needle. He closed his eyes and then he opened them again. The room was suddenly filled with purples and blues and strange under-colors which he couldn’t right then name. He imagined that it was what it would look like if he drowned far under-water. He took a deep breath and died with his lungs full of air. Charlie dragged the heavy metal across the rocks and the screaming ice, through the wet snow and the black soot of the Alaskan wilderness. His gloves were torn and the color of the cloth around his fingers had blurred into red. His hands were cut in three places, but holding onto the metal helped him to numb the aching and slow the bleeding. The weight made him move even more slowly than he would have otherwise. It was unlikely that he could survive the walk back to civilization or that anyone would find him, even in the best of circumstances. Dragging the damn corpse of iron and steel and space-age plastic behind him made it even less likely, but he didn’t let go. He’d earned that prize. Charlie imagined himself as a dragon slayer, pulling the dragon’s head behind him. He pictured himself owning an old-fashioned pinewood cabin one day, filled with furs and the stuffed heads of animals he’d killed. In his imagination, he would mount the dead machine up over his fireplace. The warm fire would reflect on the polyhedral corners of the broken husk. Maybe he would even see his own warped face looking back at him from the twisted surface of the metal. They’d killed it. But out of twenty soldiers standing at the beginning of the final battle, Charlie was the only one who hadn’t died fighting The Machine. Especially Amber. No one was more dead than Amber. Distantly, like a song he slowly began to hear in the background, he started to understand that he was still going to die because of the monster. He pulled harder, not letting go, straining his back and his arms to move more quickly through the ice and snow and disaster beneath his feet. He could smell the fire behind him. The rest of his enemy’s body was burning. The fire would keep going for weeks, or maybe longer. The thought slid through his mind that he might have died years before and had been condemned to drag the body throughout eternity, like some Greek hero. Looking into the distance, he saw the white landscape going on forever like a reality which no one had ever bothered to create any content for. No one had ever lived there. No one had ever dreamed there. There had never been anything more than the rocks and snow, never houses and never people. When he did eventually fall down he would become yet another part of the deep ice which flowed across the land like a slow eternal river. Charlie walked on and on for what felt like a day or more. The soot disappeared. He couldn’t see the smoke in the sky behind him anymore. In front and on his sides, the world looked like empty paper. There weren’t even any trees. The only decorations behind him were his black and filthy footprints. It was at this moment he realized that he wasn’t carrying the mechanical corpse anymore. He didn’t know when he had let it go. He took a few running steps back, but couldn’t even see it in the distance. He must have walked on for hours without his prize and not even noticed. The soldier looked at his hands. His right glove was gone. Maybe it had fallen off with the robot? His left hand was bunched up into a hard fist which he had been squeezing for hours. Slowly, Charlie opened his hand. The pain was horrible. He fell down and all of his fingers smashed into the ice. There was no sensation in his right hand anymore. He sighed, breathing in the frozen air. His life would have been so different if he hadn’t had to go out to fight. He was a singer. He had albums he wanted to write. He had songs in his head which he had never written down, never sung for anyone. He had work to do, and all of that sci-fi barbarianism had been a terrible interruption in the life he had been meant to live. The war came just when life had finally started to get good. All the while he had fought The Machine, he imagined the war was only a distraction. He was fighting to get the interruption over so he could get back to work. He hadn’t stood up again yet. He was still on his hands and knees on the ice. What would that other life had been like? What would he have created? What would he have seen? Would he have married Amber and had children with her? He breathed the Alaskan air in again. In his mind’s eye he was in that pinewood cabin already. Amber was there too, holding a baby. They both looked up at the severed head of The Machine above the fire. What’s the point of saving the world, when your world ends anyway? Somehow, Charlie struggled up onto his feet and started moving. He couldn’t say if he walked on for a long distance more or for only a few steps before he fell. And when he fell the second time, he closed his eyes and slept. With his eyes closed, Charlie’s imagination replayed the day’s events, but it was a confused and distorted version of the day. Instead of the soldiers who had really fought at his side, he dreamed his brothers were there, and his parents, his friends, even people he had known vaguely at school – people he hadn’t thought about in a decade. They all wore uniforms and carried guns. They all wore those fluffy white coats the government had issued. In his dream, Charlie’s brother commented that the coats looked like a colorless version of the one Han Solo wore in The Empire Strikes Back. It was particularly strange to Charlie because he hadn’t made the connection in his own mind until his brother pointed it out in the dream. He was dimly aware that it was a dream, and it didn’t seem right that a person he had dreamed up could know things before he, the dreamer, did. When he awoke, there was grass between his fingers. It was wet and there was snow on his face. His beard was cold and stiff. He looked up and he could see white stars shining against the blackest and deepest sky he had ever seen. They were so bright and appeared to be close enough that he could reach out and touch them. He could see galaxies. He could see cosmoses swimming together like fish against forever. He brushed the ice from his face. Charlie’s fingers hurt like they were on fire, but all ten digits were moving again. He found himself looking around for the robot’s head. There was still no sign of it. Up ahead, he could see some green fir trees. He understood that reaching them didn’t mean he would survive, but that direction at least meant life. Life could exist over there. He felt a kinship with the green. Charlie moved like an old man through the snow. His long legs were never good at holding heat. He had been wearing the best thermal protection that he could have for the trip, but it wasn’t made to protect anyone for this long out in the elements. They had talked about killing The Machine as if it meant saving the world. But Amber was dead now. It seemed contradictory to Charlie to say that there was still a world, but that she was dead and gone forever. Who could he go and fight to get her back? What monster could he rescue her from? No, that’s not how life worked. A fog descended as Charlie got closer to the tree-line. By the time he felt the bark against his arms, he couldn’t see the tops of the trees anymore. A low bough hung down like a hammock. He was unable to resist pausing and resting on the natural seat. He leaned back and felt another branch support the small of his back. He could have slept right there. And then the growling started. At first he thought it was a bear, and then he was sure it was a wolf. It was loud like a bear, but he wasn’t quite sure. Could it be a moose or a raccoon or something he just didn’t know the call of? The growling drew closer and closer and Charlie decided, as if he were able to choose his reality, that it was a dragon. It might as well be a dragon, because he couldn’t fight anything at that point. Even if it were just something small like a squirrel, the odds were that the animal was going to eat him. And the growling got louder. The dragon drew closer. Charlie didn’t stand up. He understood that, at that moment, he couldn’t control whether he was going to die or not. He could only control how he faced it. Charlie breathed deeply. He closed his eyes and thought of Amber. Then he opened them again. The beast stood right in front of him. It was a bear and it was a wolf, and a moose, and a squirrel, a raccoon, he became aware that it was even a dragon. The beast of beasts stood cursing and venting and coughing. White lines of cold smoke blew from its dark nostrils. Horns protruded from its head in at least a dozen variations. “Are you here for me because you’re hungry, or because you hate me?” Charlie asked. The beast spoke back in a deep and rumbling voice. “You don’t have to fear this death. It’s no more real that the thought of dying. Your war, your love, your life have all been a fiction written for no other reason than to create you. “What will they want me for?” Charlie asked. Charlie saw, or imagined he saw (he wasn’t sure which) that the beast was eating Amber. Its long furry face was covered in her blood. Her ribs protruded up through the snow. He heard the animal chewing and biting and ripping her body. “And that is how you fly the ship,” The monster said. He listened as bones broke and it sucked on her flesh. He watched as her fingers and her arms disappeared down the animal’s massive throat. He smelled her on its hot breath. Charlie looked again. The animal wasn’t eating Amber at all. It had been eating him. His feet were gone, his legs were gone. His whole body beneath the waist had disappeared. And, he fell asleep. Charlie woke up again. He wasn’t in the tree anymore. He was in a soft and flat bed, without any sheets, blankets, or pillows. He opened his eyes and was greeted by a flood of purples, blues, and other deep colors. For a few moments, he couldn’t see through the dark after-images. Slowly they faded and a room came into view. It was a large, white, domed room. There were statues in a circle near the ceiling. Everything looked like it was made of marble, or some similar stone. He didn’t see a direct source of light, but the rock itself seemed to give off a pure white glow which filled the space. He became aware that a man was sitting in a chair next to him. The man looked like a scientist or a college professor. He looked exhausted. His hair was thick with grease and looked like he had slept a night or two without washing it. It stuck straight up into the air and away from his face. Charlie wondered if the man might be Icelandic, or maybe Irish? The man frowned and scribbled in his notebook. It looked like he was writing in cursive. He didn’t enjoy Charlie’s joke. Charlie ran his hand over his face. He’d been shaved in his sleep. His nose had been straightened. There was a scar on his forehead. It felt like someone else’s face. The stranger didn’t reply. He wrote what must have been two or three paragraphs about Charlie’s answer. He was fast and sloppy, eager and scattered. “You’re not a doctor,” Charlie challenged him. “I am, actually.” The stranger had a fake laugh. Charlie sat up. The man held out a hand to hold him back, but didn’t quite touch him with it. Charlie smacked it away. The stranger was clearly shocked. He almost fell out of his chair. There was the sound of a small piece of metal or glass hitting the floor. The stranger bent down to pick up whatever it was. Charlie put his feet on the floor. He nearly slipped. His legs were different and he wasn’t use to them at first. The floor seemed to be wet. Charlie looked down and saw about two dozen dead bodies all slumped against the marble. The dead were all wearing long white robes with gold trim. Charlie seemed to be dressed the same way. Some of the bodies were bloody, and a thick red pool of juice had gathered outside of the mouth of a man crumpled just a few inches from the bed Charlie had been lying in. The stranger was on his knees. His body was twisted away from Charlie, but he had turned to look back at him. He had just picked up a long syringe from the floor. He looked frightened. “What is this place? Who are these people?” Charlie shouted. “You’re they. They’re, um, you. We actually have spoken before, many times.” The stranger stood up. He tried to conceal the syringe behind his back. The man’s body language told Charlie that he still intended to use the injection on him. Charlie took a closer look. The faces were shaven. The noses were repaired, but they all did look like him. And the couple he could see clearly all had a funny scar in the center of their foreheads. He hadn’t had that scar before. “I need to know what you know. What you don’t know that you know. I need to see what you can remember. Is every iteration the same? Is every iteration the different? I’ve interviewed you twenty-five times and you’ve never given me exactly the same answers. Am I the difference? Or are the different Charlie Daemons different from each other in some little ways?” Exasperation dripped from the scientist’s voice. Charlie took the syringe from the cringing doctor. Then Charlie grabbed the man by the shoulder and drew him in. He held the syringe against the scientist’s throat. Instead of words, Charlie growled like the bear, the wolf, the dragon which had taken him from his old life. And he stabbed the syringe into Aelfwyrd’s neck. The needle went in and it delivered the poison, but more than that, the glass shattered and the pieces were stabbed into the exhausted man’s neck. Charlie let go and then shoved him in the chest, knocking him backwards to the floor. Aelfwyrd died screaming and shrieking in horrible pain.